Okay, let's get down to business. You have reviewed your Snapshot Reports, you have an idea of how to improve your visitor experience and you have planned out what you want to change. Now it is time to put it into action and test out your plan. 1. Go to A/B Testing. 2. Click on Create your first A/B Test or the plus (+) at the top of the dashboard. 3. Choose the page you want to test. 4. Choose the audience that you want to test: (1) Desktop visitors, (2) Mobile visitors, or (3) Tablet visitors. Next, use the Crazy Egg Visual Editor to create variants. 1. Click Create New Variant to create one or more variants of your page that you'd like to test. Within the sidebar menu, the Control is always your original page. You CANNOT change the Control. Variant #1 on the hand is the adjusted version. 2. 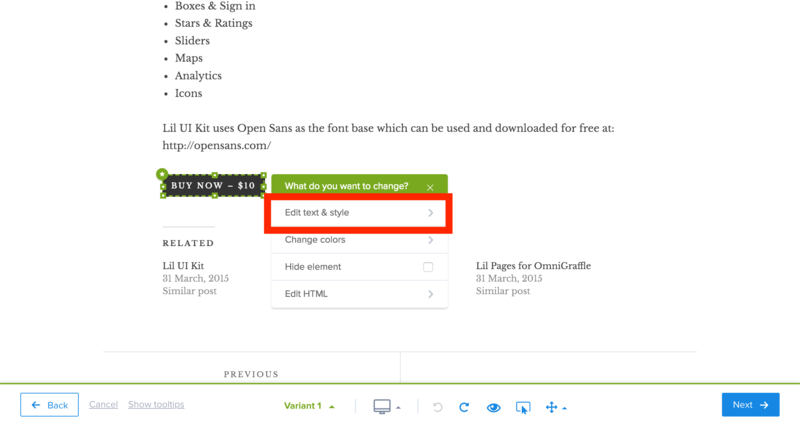 Once the Visual Editor has loaded your page, select an element that you want to edit. For example, let's select the BUY NOW - $10 button and change the copy. 3. Click on Edit Text & Style. 4. Use the inline editor to change the text. Click on the close button (X) once you are done. Here, we've changed the copy from Buy Now - $15 to Buy Now. When someone clicks a button/link. For example, Crazy Egg will record that you sold a product when a customer clicks on the Buy Now!button. When someone reaches a page. For example, Crazy Egg will record that you sold a product when a customer reaches the Order confirmed! page. When someone submits a form. For example, Crazy Egg will record that you received a registration when a customer clicks on the Register button within a form. When someone triggers a script. This method is for more advanced, technical users. In this test, we want to see if changing the text of the button from Buy Now - $10 to Buy Now will get more people buy the product. So we've set-up the goal as Sell more products. To determine this, I consider a product sold when someone has clicked on the Buy Now button. A red star highlights the button I have chosen to track. Set up a name for this goal. Click Next when you are happy with the goal you've set-up. Once you have defined your goal, create a custom name for your test. Be sure to place a check mark in Set up Snapshots! Creating Snapshots based on your AB variants is crucial for future success in AB Testing planning. Next, make your test live by clicking on Start testing my ideas! Important Note: You will NOT be able to edit your variants once the test has started. Review everything before starting the test. Congratulations! You’ve launched your experiment and now you’re ready to check out the Results page. It will take about 24 hours for your site to see your variants live.